Portland, Ore.-based TriMet will start the process of choosing a name for the Portland-Milwaukie Light Rail Bridge on September 5 and include two phases of public input. This will mark the first time in the region’s history that the public will have the opportunity to suggest names for the first new bridge over the Willamette River in more than 40 years, according to the transit agency. RELATED: Time-lapse video of TriMet's Kellogg Bridge construction. The Portland-Milwaukie Light Rail Bridge Naming Committee is a group of diverse leaders who reflect a shared sense of place. The committee will be chaired by Chet Orloff, an initiator of the Portland Names Commission, and a 22-year member of the Oregon Geographic Names Board. He has also served as executive director of the Oregon Historical Society, founded and edited the journal Western Legal History, and served as senior editor of the Oregon Historical Quarterly. 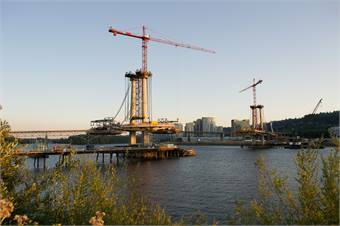 The bridge will be the first cable-stayed bridge for the region, extending 1,720 feet (.326 miles) over the Willamette River, and carry transit, cyclists and pedestrians but no private vehicles. Emergency vehicles will be able to access the bridge if necessary. The 7.3-mile project is the region’s sixth MAX construction project to be built.